This July I hopped on the Trans-Siberian Railway and traveled from China to Russia via train, with a few stops along the way. I got makeovers in malls in Beijing, Ulaanbaatar, and Moscow. 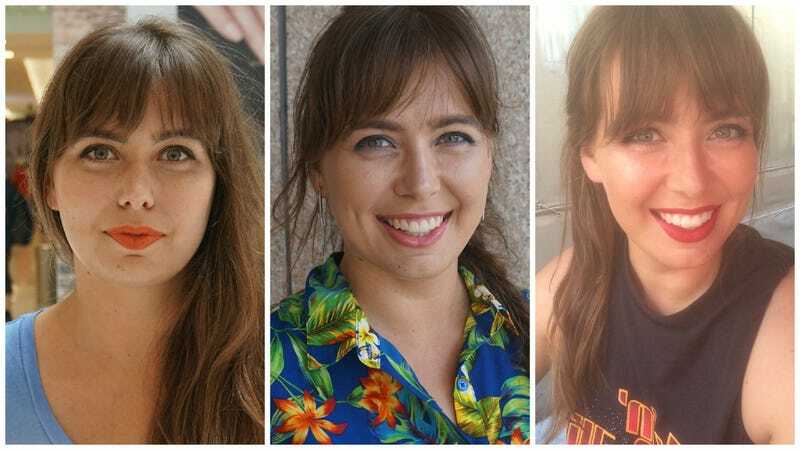 The following details three makeovers from three wildly different cities, and also the progression of my bang growth over three weeks. Beauty Routine: My beauty routine is a bit of a crapshoot, depending on how lazy I’m feeling. The one thing I am religious about is washing my face twice a day, but other than that it’s a toss-up. A lot of days I’ll either wear no makeup or simply a quick foundation and blush/highlighter combo. When I go out, I like to add some dark eye shadow and vibrant lips. Beijing Trends: The short description of Beijing makeup trends is: K-pop star. I saw a lot of flawless matte skin, going for very heavy coverage with a dewy finish (often in a few shades lighter than what seemed to be someone’s natural color) with just a hint of very well blended rosy cheeks. Sensational skin is the only priority for many women, but if they are wearing any other makeup, it’s often very thin black liner, sometimes painted into a cat eye, and maybe a neutral lip color. In the evenings, I saw a lot of younger women with some brighter matte lipstick in summery shades. Process: For the makeover, I headed to the China World Shopping Mall in Beijing and after doing a lap around the mall settled on the Sephora store. I don’t speak Mandarin, and the women in the store seemed embarrassed speaking to me in English or interacting with me at all, and confused as to why I wanted a Beijing-style makeover. After a lot of sign language and awkward smiling, I sat down with a makeup artist who seemed nervous to have been assigned the job. She was polite and even a little apologetic but worked quickly and silently on the makeover, giving me the basics – some foundation, a few quick swipes of blush, cat eyeliner like I had seen many Beijing women wearing, and a bright lip. Outcome: I was pretty meh on the makeover. The only product she put on my skin was a Make Up For Ever liquid foundation, which I also use sometimes, but she went two or three shades lighter than I usually go, and I was expecting more use of a primer or a moisturizer. My eyeliner was a little haphazard, and although I loved the lipstick in the tube, after looking at the pictures afterwards I’m not sure it was the right shade for me. To be fair, I have a feeling that the makeup artist might have taken more time or put a little more effort in had we been able to communicate freely, but alas, there we were. I got a “Yeah, you look nice, can we go now?” from my travel buddy, so - relatively meh all around. Ulaanbaatar Trends: The emphasis on flawless skin continued in Mongolia. I saw a lot of heavy matte coverage, although Ulaanbaatar women seem a little more willing to experiment with color than in Beijing. The cheeks are rosier and the eyeliner, while still a black cat eye, tends to be a little thicker. I didn’t see too much eye shadow, but when I did, it was like the eye shadow the makeup artist did on me – a block of one or two relatively bright colors covering the entire lid. I also saw a lot of very bright pink lips in Ulaanbaatar. Process: I got my makeover at the Ulaanbaatar Department store, which had several high-end cosmetics counters. The women at Chanel seemed the friendliest, and after another conversation that included a lot of sign language, I sat down and let a makeup artist named Emma go to work. She was an absolute professional who left no stone unturned, and seemed to really enjoy her job. She worked like an artist working on a new painting, taking her time and assessing her work from different angles. At a few points she seemed to have a flash of inspiration and would run off to grab a new product. My travel bud (who sat through all three makeovers) said that Emma was the most fun to watch work. Outcome: Under the glow of the Chanel makeup counter, I was super jazzed about this makeover. I thought my skin looked as great as it ever has, and was surprised at how light it felt despite Emma’s use of several priming, moisturizing, and finishing products. I was also really feeling my eyes. I never would have chosen bright blue eye shadow and sparkly turquoise mascara for myself, but it made me feel like a giddy bird of paradise. Later, though, away from the twinkling Chanel lights, my excitement faded a little. It looked a little heavier on my face than it felt, and my eyes felt less ‘tropical queen’ and more ‘tween who just discovered Wet n’ Wild,’ especially considering I went to go drink cheap beers in a kebab tent and not, like, attend a high school homecoming. All that being said, though, Emma was fantastic and I think that in a better time and place this makeover would have been 100% perfect fun. I chatted about trends with my makeup artist, she said that makeup is very seasonal in Moscow, with the fall leading to a bunch of brown lips, and the winter bringing even heavier eyes and rosier cheeks. Process: I went to the MAC store at the TSUM Department Store in the heart of Moscow for the makeover. My wonderful makeup artist Olga confirmed my suspicious about the severity of Moscow makeup when she scrunched up her face and said “WHY! ?” when I asked her to do me up in the Moscow way. She said that in the summer, women often come in wanting very bright eyes, super bright lips, and especially heavy contouring. She told me the first time someone asked her for the Kim Kardashian look was about a year and a half ago, and she had to run and look her up on her phone, and said she remembers thinking, “Oh no, this Kim will have everyone thinking they should do a red carpet when they should do a nothing.” She now has caught up on “this Kim” and company, though, and loves Kanye and thinks they’re the real deal. She relented a little on following the trends when I told her what I was doing, but seemed determined to not go too extreme. She prepped my skin well and explained what she was doing the whole time, while also talking to me about why she was using certain shades with my complexion. She gave me heavy mascara and some colorful eye shadow, per the Moscow trends, and a good dose of blush and highlighter, but made sure to keep anything from going over the top. Outcome: As Vanessa Williams would have said, we went and saved the best for last. I felt like a babe. Olga was an absolute delight in every way, and the makeup held perfectly throughout the entire day, from walking around Moscow to going to the ballet to drinking beers and eating a hot dog in the park later. I couldn’t buy the lipstick - fittingly named Russian Red - fast enough. My travel buddy was sufficiently wowed and commented throughout the day how happy he was that I now had the lipstick in my permanent possession. I even had to admire my cheeks, which I normally wish would fade into oblivion. Cheers to Olga for putting just enough Moscow on my face to make me feel fanfuckingtastic. Rachelle Dragani is a freelance writer slash Brooklyn nanny who would one day like to participate in the world’s first mall makeover in space.